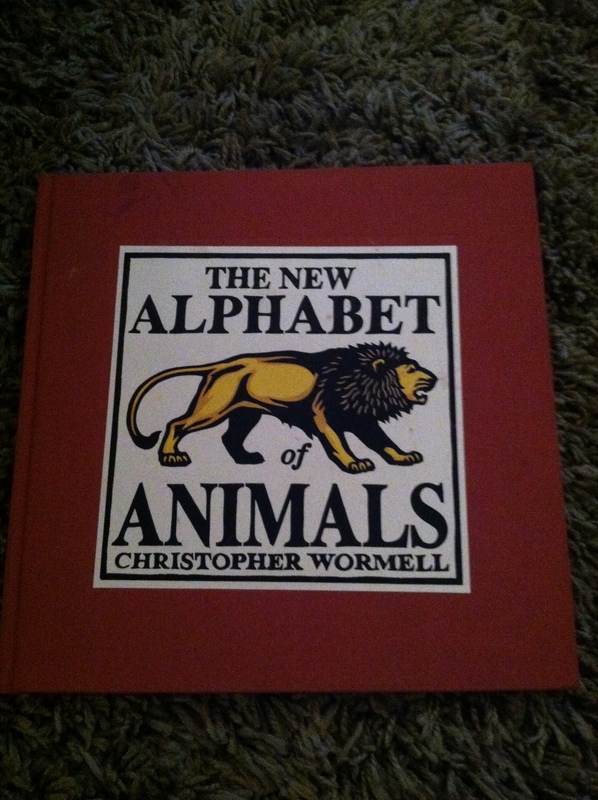 This is the very first book I bought for Arwen. I bought it for her at the Smithsonian while on a school trip, the week before she was born. I’ve never been nervous to travel. In fact, I have a dose of wanderlust in me that can be difficult to contain at times. But this particular week, I was terrified to travel. Terrified because my sister-in-law’s due date was quickly approaching and I did NOT want to be in Washington, DC, while my niece was coming into this world. I called every day to check on progress and effacing and dilation and had back up plans for flying home if needed. But I made time to buy her a book. And not just any book. An Alphabet book of cool paintings and weird animals. A wicked expensive book because I bought it at the Smithsonian. Her first book. Tonight I was hanging out with her at her house. She knows I love books as much as she does, and we straighten up her bookshelves and talk about her books and read a few of them every time I go over there. At the bottom of the shelf I found this, and it made me smile thinking about how long it took me to find the first book for the firstborn of the next generation of Masons. I spent nearly a half hour looking through all the options they had. I read them and thought about which one I wanted to be a family heirloom. I pondered the quality of the books, thought about how it should really be gender neutral so it be enjoyed by all other future kids. It needed to be educational, not just entertaining, special and not hokey, and as theologically sound as a book can be when you’re buying it from the Museum of Natural Science at the Smithsonian. Thus the reason we ended up with a hardback Alphabet book. “My very first book?” she replied in complete amazement. “Yes,” I said. “I bought it for you before you were even born.” And I then proceeded to tell her the whole story about being in DC, about taking SO much time to pick out the perfect book, just for her, about the snow storm that threatened to keep up snowed in up in DC, and about how nervous I was that I wasn’t going to get home in time to be there when she was born. She sat perfectly still (a RARE feat these days) and listened to the whole story. When I finished, I fully expected her to, with all the depth and reflection and appreciation of a two year old, to just ask me to read it to her. She was absolutely dumbstruck that I thought about her before she was born. Not only that I thought about her, but that I took the time to pick out something just for her. Before she was born. She was loved. Thought about, planned for. Dreams were dreamed for her. Lives were imagined. Books were bought. She was chosen and loved well before she was born. And she simply couldn’t believe it. She was loved before she was born. But so was I. And so were you. And not just by your family. Before you were born you were loved. You were set apart. You were created with a specific and unique calling. You were chosen. Thought about. Looked over. Anticipated. Before the foundation of the world, the God of the universe knew your name, numbered your days, considered your ways and set them before you. Before you were born. I am dumbfounded and amazed by that, and sometimes, like Arwen, I simply can’t believe it. But as much as I poured all the love and affection I could muster into that present for that child I had never met and yet loved, God has loved me with an infinite, unending, unwavering love, from before time began. She was amazed by the love shown to her through a book. I am amazed by the love shown to me through a Book, too. This entry was posted in relationships, Uncategorized and tagged Alphabet books, Arwen, books, Chosen, Family, Jeremiah, love. Bookmark the permalink. Aunt B, how sweet! You made her momma cry! that was beautiful. And truth.